A course to learn how to create your own iBooks using Book Creator app and iBooks Author* with creative ways to use iBooks in the classroom as resources. Also learn how to create other interactive resources that are cross-platform (not just iPads) and can be used in all curriculum areas. This full day course will give you strategies, ideas and instructions and includes some more advanced techniques and hands-on time to make your own resources. Bring an iPad and a laptop to get the most out of the day. Click HERE to register for Coffs Harbour or HERE for Ballina. 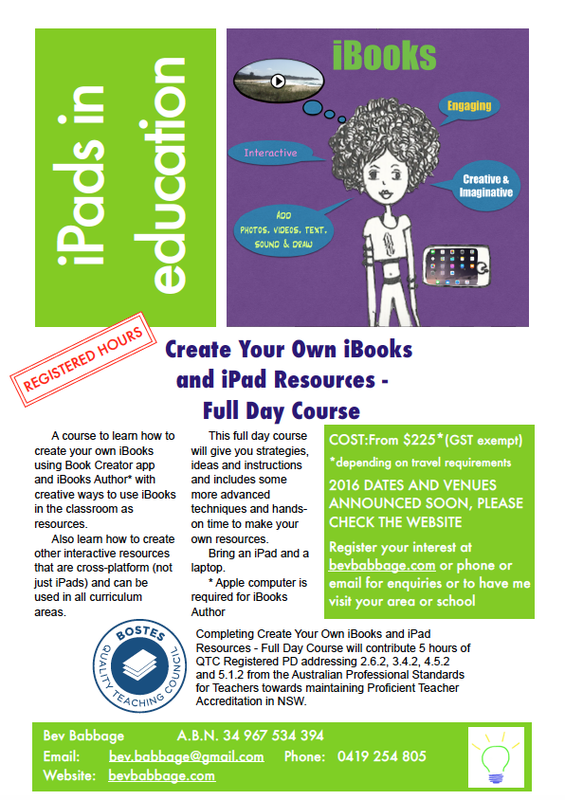 Completing Create Your Own iBooks and iPad Resources – Full Day Course will contribute 5 hours of QTC Registered PD addressing 2.6.2, 3.4.2, 4.5.2 and 5.1.2 from the Australian Professional Standards for Teachers towards maintaining Proficient Teacher Accreditation in NSW. From $225 per person (GST exempt), depending on travel required. If your school prefers to pay be cheque, I can send an invoice. An iPad with wifi capabilities, preferably with the most recent IOS update. You will be sent a list of suggested apps to install after you have registered. Also bring a laptop if possible for creating some of the other resources. An Apple computer is not required for all content, only the iBooks Author portion.